We ordered 5,000 Plays from TweetAngels to test their services, and they came through with flying colors. Our Plays arrived in full very quickly, the same day we placed the order. They also have a good refund policy in place, and customer support was very responsive to our questions, answering quickly with good information. Overall, we recommend TweetAngels to any musician on SoundCloud who wants to improve their social proof. 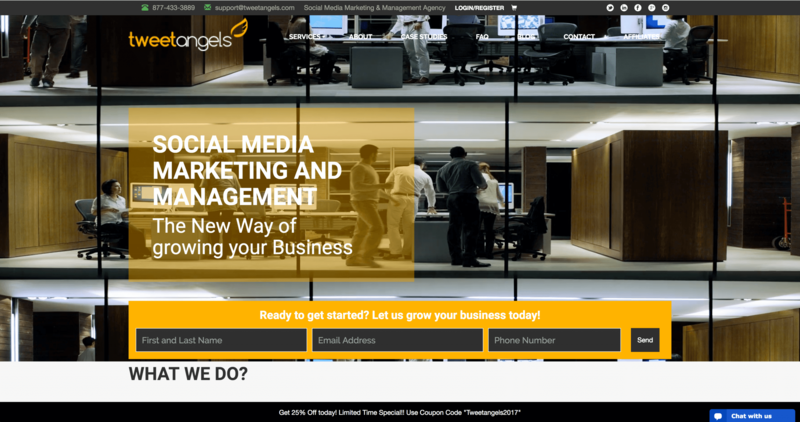 TweetAngels was founded in 2010 and is based in California, USA. Their website makes them come across as a very professional company, unlike many others in this industry. They offer a comprehensive set of social media marketing services, for Twitter, YouTube, Instagram, Facebook, LinkedIn, and most recently SoundCloud. You'll also find SEO and web optimization services, a nice addition that can help you strengthen your presence on the web. For SoundCloud, TweetAngels currently offers Plays and Followers. Their Plays packages are scheduled to arrive within 6 days for the smallest package, to 15 days for the largest. You can split the Plays between tracks if you make a special request. We reviewed the terms and conditions sections on the TweetAngels website and made a few comments on their status below. To find out more details on these, then please toggle the sections to see what we thought! TweetAngels has a standard Terms and Conditions. TweetAngels offers a 100% Money-Back Guarantee if they do not deliver as promised. Refunds are not guaranteed for special packages, though they may be granted. TweetAngels does not offer a Retention Policy for SoundCloud Plays (however, SoundCloud Plays can't be removed). 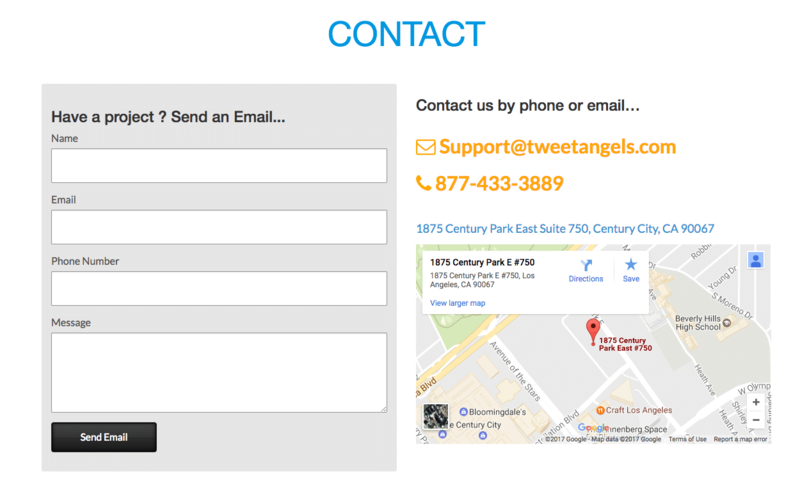 You can easily get in touch with TweetAngels through the Contact link at the top-right. Once there, you'll have a number of ways to get in touch with them. Before ordering, we sent TweetAngels a few questions to test their customer support. As you can see, they answered very quickly with a very friendly and informative response, addressing all of our questions. 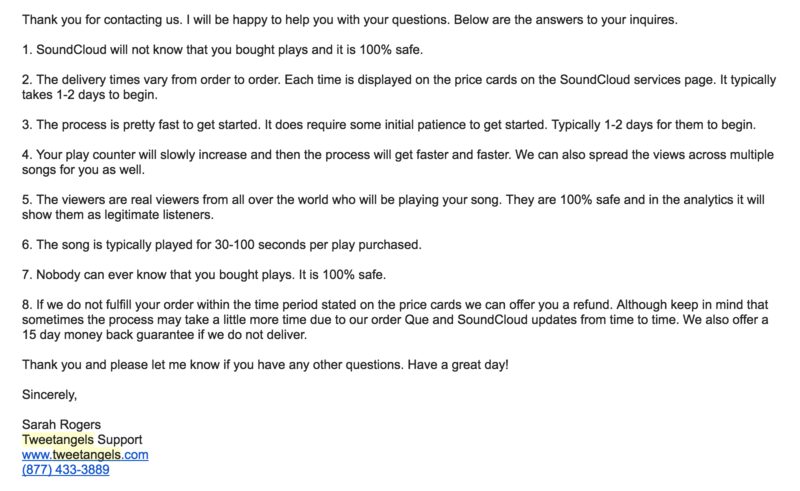 "SoundCloud will not know that you bought plays and it is 100% safe." "The delivery times vary from order to order. Each time is displayed on the price cards on the SoundCloud services page. It typically takes 1-2 days to begin." "Your play counter will slowly increase and then the process will get faster and faster. We can also spread the views across multiple songs for you as well." "The viewers are real viewers from all over the world who will be playing your song. They are 100% safe and in the analytics it will show them as legitimate listeners." "The song is typically played for 30-100 seconds per play purchased." "Nobody can ever know that you bought plays. It is 100% safe." "If we do not fulfill your order within the time period stated on the price cards we can offer you a refund. Although keep in mind that sometimes the process may take a little more time due to our order Que and SoundCloud updates from time to time. We also offer a 15 day money back guarantee if we do not deliver." After ordering, we sent TweetAngels another set of questions to see if they treat a paying customer any differently. Once again, they answered quickly, addressing all of our concerns. Excellent! "The plays cannot be removed. Our plan are organic, so you do not need to worry about that." 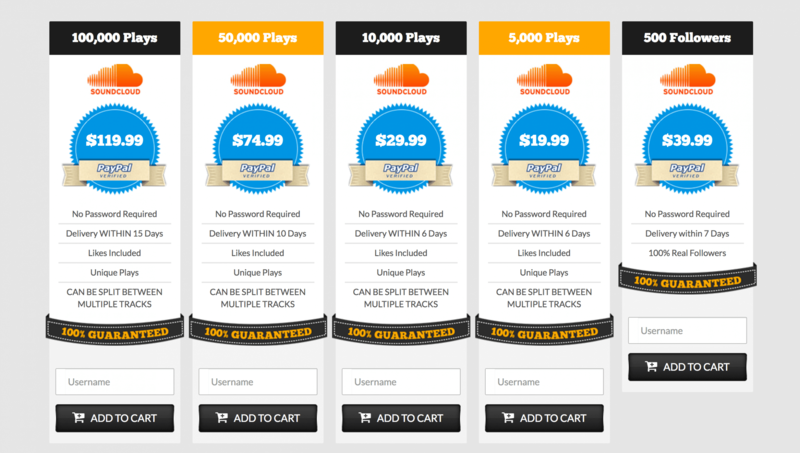 "Soundcloud cannot determine that your plays were bought because they are organic. Nobody can tell that either and our service is fully confidential so you do not need to worry about that." "Yes, we can offer you 25% off if you want to order again. I can send you a coupon code or you can also become an affiliate with us." "We also offer Soundcloud Followers at the moment on the same page as the Soundcloud plays." We recommend TweetAngels to any musician who wants to boost their social proof by purchasing SoundCloud Plays. As you can see, our 5,000 Plays arrived in full the same day we ordered them. Delivery was fast, so if you want to have them spread out you should send TweetAngels a message with your order. Our order of 5,000 Plays from TweetAngels went just as expected - no complaints. The Plays came in full the same day we ordered them, much faster than the expected delivery time of within 6 days. Their customer support was friendly and intelligent, able to quickly answer our questions with good answers. They come across as a more professional company than most in this industry, and they offer a refund in case there's an issue with your order. Overall, we would recommend the Plays service of TweetAngels to any musician on SoundCloud - they can help you improve your reputation and gain more attention. My order for 7000 plays was delivered in 48 hours. The customer support was friendly and professional. This is a service i would recommend to anyone serious about their music career and wants to increase their social proof. Its an excellent service for that. A professional customer support coupled with a fast delivery of the 6000 plays we ordered was everything we could have asked for from them. Thank you tweetangels for keeping your word and helping us grow our following. I ordered 2000 plays and got them on the same day in perfect quality, the customer service representative was attentive and got me what i wanted. Their ability to deliver a few thousand Soundcloud followers in a few days was key in boosting my latest tracks. I have purchased SoundCloud plays and they were delivered in a very organized way. Satisfied client. Dealt with them and their communication channel was very open. Customer service is therefore key for me.